Pamela Dorman Books, 9781101981238, 336pp. Nora, the owner of the Miss Guthrie Diner, is perfectly happy serving up apple cider donuts, coffee, and eggs-any-way-you-like-em to her regulars, and she takes great pleasure in knowing exactly what's "the usual." But her life is soon shaken when she discovers she and her free-spirited, younger sister Kit stand to inherit the home and land of the town's beloved cake lady, Peggy Johnson. Kit, an aspiring--and broke--filmmaker thinks her problems are solved when she and Nora find out Peggy was in the process of selling the land to a big-box developer before her death. The people of Guthrie are divided--some want the opportunities the development will bring, while others are staunchly against any change--and they aren't afraid to leave their opinions with their tips. Time is running out, and the sisters need to make a decision soon. But Nora isn't quite ready to let go of the land, complete with a charming farmhouse, an ancient apple orchard and the clues to a secret life that no one knew Peggy had. Troubled by the conflicting needs of the town, and confused by her growing feelings towards Elliot, the big-box developer's rep, Nora throws herself into solving the one problem that everyone in town can agree on--finding Peggy's missing dog, Freckles. When a disaster strikes the diner, the community of Guthrie bands together to help her, and Nora discovers that doing the right thing doesn't always mean giving up your dreams. Louise Miller is the author of The City Baker's Guide to Country Living. She is a pastry chef who lives, writes and bakes in Boston, MA. 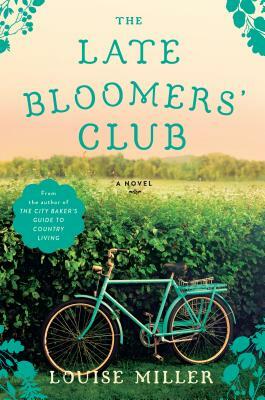 The Late Bloomers' Club is her second novel.